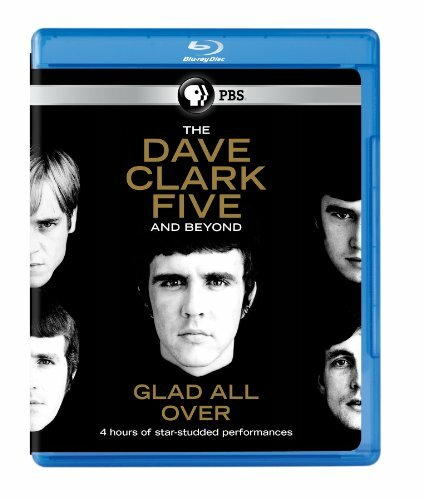 Arlington, Va. PBS Distribution is releasing The Dave Clark Five And Beyond: Glad All Over on DVD and Blu-ray. Great Performances presents a look at the British invasion 50 years after both the Dave Clark Five and the Beatles hit our shores. The Dave Clark Five And Beyond: Glad All Over features newly filmed interviews with Sir Paul McCartney, Sir Elton John, Bruce Springsteen, Steven Van Zandt of The E Street Band, Stevie Wonder, Sharon and Ozzy Osbourne, Gene Simmons of Kiss, Whoopi Goldberg, Dionne Warwick, '60s fashion icon Twiggy and Sir Ian McKellen, all sharing their memories of how the music of the '60s and the cultural revolution of 1964 changed their lives forever. And Tom Hanks' moving speech at The DC5's Rock & Roll Hall of Fame induction ceremony in 2008, interwoven throughout the documentary, lends context to the band's legendary career. The Dave Clark Five And Beyond: Glad All Over will be available on DVD and Blu-ray May 13, 2014. The DVD SRP is $29.99 and the Blu-ray SRP is $34.99. Disc 1 features the extended director's cut of the documentary, which is approximately 120 minutes. Disc 2 features bonus video - extra interview scenes and rare archival footage, including never-before-seen star performances and alternate performances from The DC5! This bonus disc is approximately 120 minutes. Included in the film are The DC5's iconic performances on "The Ed Sullivan Show," along with rare live concert footage and their countless appearances on television with American musical icons. Much of this material - much of it on 35mm film - has not been seen in decades, either on television or home video. The film also features never-before-seen footage from Clark's personal archives together with performances by the Beatles, the Rolling Stones, the Who, Dusty Springfield, Stevie Wonder, the Supremes, Martha Reeves and the Vandellas, Marvin Gaye, Otis Redding, Freddie Mercury of Queen and Sir Laurence Olivier. The DC5 were the first English group to tour America (in May 1964), thus spearheading the British Invasion. They achieved a record-breaking 15 consecutive Top 20 U.S. hit singles within a two-year period - more than any other group in the world except the Beatles. They appeared a record-breaking 18 times on "The Ed Sullivan Show," with its weekly audience of 70 million viewers - more than any other rock, pop or R&B artist. They took the world by storm and helped change the rock scene, blasting hit after hit over the world's radio airwaves. The Dave Clark Five And Beyond: Glad All Over features scenes from their feature film Catch Us If You Can (Having a Wild Weekend in the U.S.). The group is seen with Lucille Ball (on whose "Lucy in London" special they guest-starred), Dean Martin, and Richard Chamberlain. The DC5, the Beatles and the Rolling Stones were all war babies, born during World War II. The film highlights The DC5's working-class roots in war-torn England and tells in fascinating detail the story of how the five - Clark, Mike Smith (an underrated rock vocalist, as several of the luminaries in the film attest), Denis Payton, Rick Huxley and Lenny Davidson - met while training in the gym two nights a week in Tottenham and their rise to worldwide fame, selling more than 100 million records in the process. Clark, a fan of the legendary Buddy Rich, was the drummer and manager of the group; his drumming was a key influence on Springsteen, Max Weinberg, Van Zandt and others. Clark - whom Elton John praises in the film as a "stone-cold genius" - made sure they owned the masters of all their music and video appearances. Further demonstration of Clark's business acumen was his acquisition of the pioneering classic British rock/pop series "Ready Steady Go!," which was released on TV and video throughout the world. In the United States, it was released on the Disney Channel, which billed it as "a timeless treasure." Clark studied at London's Central School of Speech and Drama and with Lee Strasberg at the Actors Studio in Los Angeles. He created the long-running British musical Time, which featured the hologram image of Olivier. Clark had the privilege of directing him in his final theatrical performance, one that received critical acclaim. Great Performances is a production of THIRTEEN for WNET, one of America's most prolific and respected public media providers. Throughout its 40 year history on public television, Great Performances has provided viewers across the country with an unparalleled showcase of the best in all genres of the performing arts, serving as America's most prestigious and enduring broadcaster of cultural programming. Over the course of its four decades, the series has been the home to the greatest artists in the areas of drama, dance, musical theater, classical and popular music, providing many with their very first television exposure. The Dave Clark Five And Beyond: Glad All Over is a production of Dave Clark International and THIRTEEN Productions LLC in association with WNET. For Great Performances, Bill O'Donnell is series producer and David Horn is executive producer. Major funding for the Great Performances telecast is provided by the Irene Diamond Fund, The Starr Foundation, The Agnes Varis Trust and PBS.